BYOM is a General framework for simulating model systems in terms of ordinary differential equations (ODEs) or explicit functions. This package only supports explicit functions, which are calculated by simplefun.m, which is called by call_deri.m. The files in the BYOM engine directory are needed for fitting and plotting. Results are shown on screen but also saved to a log file (results.out). The model: Log-logistic dose response fitting. This script: Example for reproduction data, using the likelihood function based on a normal distribution of the residuals (various transformation are optional). Make sure that this script is in a directory somewhere below the BYOM folder. % Cumulative reproduction Daphnia after 15 days exposure to cadmium. Initial states, scenarios in columns, states in rows. First row are the 'names' of all scenarios. Model parameters are part of a 'structure' for easy reference. Specify what to plot. If time vector glo.t is not specified, a default is used, based on the data set. Note that t is now used for the exposure concentrations! % modify options after this call, if needed. Here, the functions are called that will do the calculation and the plotting. Profile likelihoods are used to make robust confidence intervals. 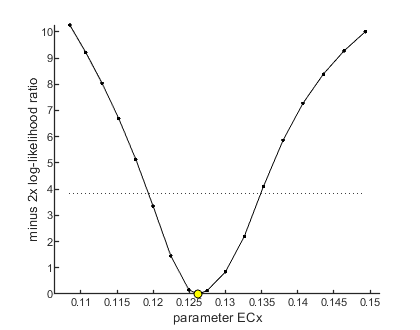 Note that the dose-response curve is plotted on a log scale for the exposure concentration. If the control is truly zero, it is plotted as an open symbol, at a low concentration on the x-axis. However, for the fitting, it is truly zero. data state 1: 4x1, continuous data, no transf. Search method: Nelder-Mead simplex direct search, 2 rounds. Total 113 simplex iterations used to optimise. Minus log-likelihood has reached the value 15.5298 (AIC=37.0596). Plots result from the optimised parameter values. By profiling you make robust confidence intervals for one or more of your parameters. Use the name of the parameter as it occurs in your parameter structure par above. You do not need to run the entire script before you can make a profile. Options for the profiling can be set using opt_prof (see prelim_checks or byom_bioconc_extra in the BYOM examples directory). % plots (below, it is added to the annotation box for subsequent plotting). Another way to make intervals on model predictions is to use a sample of parameter sets taken from the joint likelihood-based conf. region. This is done by the function calc_likregion.m. It first does profiling of all fitted parameters to find the edges of the region. Then, Latin-Hypercube sampling, keeping only those parameter combinations that are not rejected at the 95% level in a lik.-rat. test. The inner rim will be used for CIs on forward predictions. Options for the likelihood region can be set using opt_likreg (see prelim_checks.m). Note: in this example, the likelihood-region sampling takes quite a bit of time, which is related to the 'plateau' in the likelihood for parameter beta (apparently, large values of beta are not that bad; though they are outside of the 95% CI). A demonstration of the likelihood region is shown in the script byom_doseresp_surv.m. The following code can be used to make a standard plot (the same as for the fits), but with confidence intervals (and sampling error for survival data, if needed). Options for confidence bounds on model curves can be set using opt_conf (see prelim_checks). Note: A demonstration of plotting with intervals is shown in the script byom_doseresp_surv.m.